"The King of America," said the villager. "King of America, he'll come here, see our village, meet us, and see how we live!" For the inhabitants of the small village of Joypura in Bangladesh, the visit of the President of the United States to their village was a matter of great pride and honor. After all, he was the 'King of America' and the most powerful man on earth. The chaos, the upheaval, the widening of roads, the removal of unsightly shops, not to mention the invasion of hundreds of troops and officials was a small price to pay for having such an honored guest. But Joypura was only a small part of President Clinton's busy 12-hour visit to Bangladesh in March 2000. Arrangements started a month prior to his visit in the capital of Dhaka. Marines, secret service agents and U.S. security personnel arrived in the city from the beginning of March. Security equipment, bulletproof cars, scent dogs, packaged food and mineral water arrived daily at the airport. The capital's only five-star hotel was all but taken over by the President's men. The airport security and city's traffic system were scrutinized by U.S. security personnel. Roads were repaired, trees painted, road markings re-painted. Posters, portraits, American flags decorated the city. But, not everyone was ready to celebrate the arrival of the first U.S. presidential visit. KING FOR A DAY is the diary of a cynical Bangladeshi journalist as he follows the arrangements for the arrival of President Bill Clinton in March 2000, the growing tension, the demonstrations, the disappointments, whilst he tries to find out what the common man really feels about President Clinton's visit. KING FOR A DAY is a satire on globalization and its implications for the citizens of developing nations. When the president of the world's wealthiest nation decides to spend 12 hours in the capital of one of the world's poorest nations, the build up to the visit is perhaps far more important than the day itself. "For anyone still perplexed by widespread resentment at the smug exercise of American power around the globe, this inventive docudrama-narrated through the eyes of a jaded young journalist-will provide an unvarnished education. King for a Day neatly captures the phony hypocrisy of a U.S. presidential tour through South Asia in May, 2000, providing a street level view of the theatrics of American power. Clinton's insular entourage is shown blowing through Bangladesh in 12 hours like an indifferent cyclone: secret service agents stake out Dhaka's luxury hotel, while brigades of day laborers sweep and buff the road from the airport. 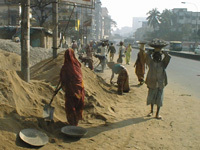 Street vendors and beggars are banished from view. Asked to speculate on 'King' Clinton's identity and intentions, the urban poor imagine that he might be the president of Iraq or that he might even convert to Islam. Meanwhile, we learn that the American delegation has its eyes fixed on Bangladesh's vast untapped natural gas reserves while sycophantic Bangladeshi ministers go begging in vain for an enhanced garment export quota. In a sickening, if predictable, denouement, Clinton's scheduled visit to a rural village is cancelled for 'security' reasons and the village is resurrected in the U.S. embassy compound for photo-ops instead. For American viewers unaccustomed to distinguishing between Hollywood, corporate media, and democracy, the well-honed cynicism of Bangladesh's public intellectuals and print media shown here will be salutary indeed." "A tongue-in-cheek poke at Bangladesh officialdom for doing their best to spruce up the country to impress the most powerful man in the world...Bangla humor at it's best. A real gem for those who know and love Bangladesh."